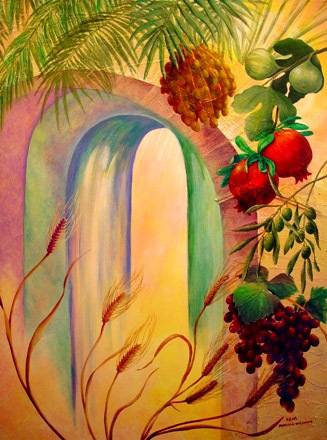 For Israel the seven “species”, as it is called, (WHEAT, BARLEY, GRAPES, FIGS, POMEGRANITES, OLIVES, DATES ) are called the symbol of FULFILLED PROMISES OF GOD. They remind the Jews that God has and will fulfill ALL of His promises. It is a symbol of eternal hope. It is a symbol of God’s faithfulness in being a “more than enough” provider. The archway in this painting was constructed out of painted tissue paper. The structure was inspired by the gate known as Zion Gate in Jerusalem. “FULLY ENTER IN!” invites our God. His promises are as good as done (maybe not in our expectations or time frame of reference). Enter into the FULLNESS of the MYSTERY, the unknown of God …..finding security ONLY IN HIS PERFECT LOVE AND PRESENCE where no fear can inhabit. The risk of this is only a perception shaped by fear.GOD IS ABSOLUTELY GOOD AND FULLY TRUSTWORTHY to make good on His promises.